Nancy Egol Nikkal has been teaching the art of collage to adults for more than 30 years, including classes at the Pelham Art Center and exhibition-related collage workshops at William Paterson University (Wayne, NJ), the Newark Museum and the Morris Museum in NJ. Collage classes include demonstration, discussion and personal critique of works in progress. 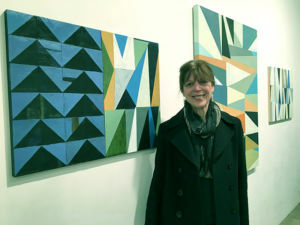 Her current studio practice is painting with acrylic on canvas and collage with painted papers on canvas and panel. Her works are included in public, private, hotel and corporate collections throughout the United States, Canada, Japan, New Zealand and the Republic of Singapore. She is a member of the Upstream Gallery in Hastings-on-Hudson, NY, the Society of Layerists in Multi-Media (Albuquerque, NM) and the Silvermine Guild of Artists (New Canaan, CT). She writes about creativity, collage, class projects, art and artists at https://artofcollage.wordpress.com. See her works at http://www.nikkal.com.